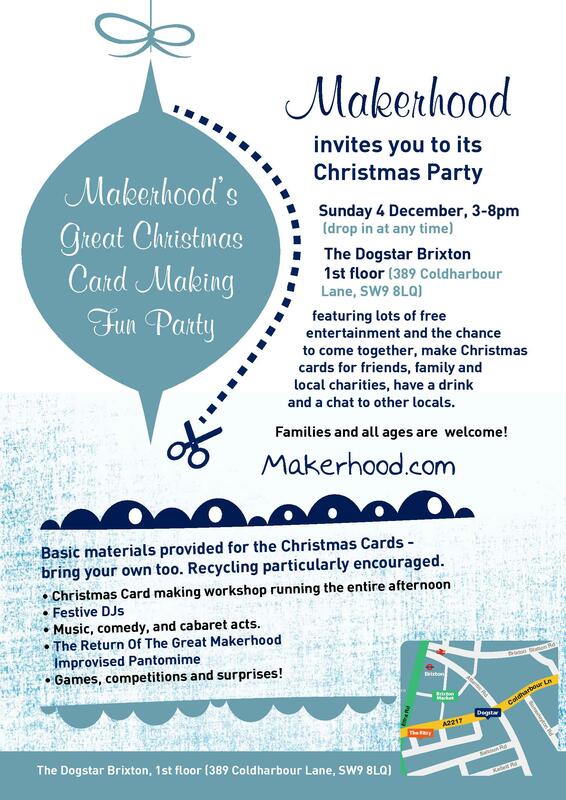 Makerhood invites you to its Christmas party! It’s a chance to come together, make Christmas cards for friends, family and local charities, have a drink and a chat to other locals. There will be lots of free home-made entertainment, too. Families and all ages are welcome! Basic materials provided for the Christmas cards – bring your own too. Recycling is particularly encouraged. No prior skills necessary. – Music, comedy, and cabaret acts. – Games, competitions and surprises! Upstairs at The Dogstar, 393 Coldharbour Lane, on Sunday 4 December between 3 and 8pm.